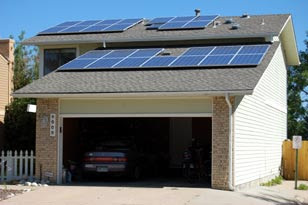 A family in Colorado have installed a 5.59 kW photovoltaic solar system on the roof of their residential garage and are reporting that in it's first month the system has generated 650 kWh worth of electricity, equivalent to 2,600 miles (@ 250 wh/mi) of driving in a plug-in electric car. Calculating PV costs against utility power savings results in fairly long pay-back periods. This particular system cost $8,500 and generates 650 kWh per month. At a standard utility rate of $0.10 kWh the pay back is approx 10 years. However, when using a roof top PV system to recharge an EV it's a different order of magnitude. The Colorado family estimate $390 worth of gas cost savings (assuming $3 per gallon and 20 m.p.g) per month. The pay-back on the purchase price of the same PV system becomes less than 2 years or 1/5th the time compared to standard utility rates. If you live in a country with higher petrol prices than the US, or a feed-in tariff, the pay-back time is even shorter. Fundamentally the purchase of a PV system is equal to paying up front for several decades worth of free motoring. A photovoltaic solar system will last 30 years + providing free energy that literally falls out of the sky. Tesla Motors estimate 20% of customers who buy a Roadster also have a roof-top PV system.